Poor guy, he has been through so much with his hernia surgery last year and now he is not feeling well again. 9/21 He was able to be ridden in a lesson. 9/27 He was showing signs of pain again. He was wobbly on his feet. I tried to ride him but decided he was too unstable. During this past month he was loosing weight. He was eating his grain but maybe not “fighting ” for his share of the hay with the herd (8 horse 2 donkey). 9/28 A chiropractor came out and gave him an adjustment. He said his hips and left back knee were out of alignment. The left hip was higher than the right. He seemed to walk away with some improvement. 10/1 He was back to being stiff and sore in the back end. He was put on a muscle relaxer and “bute” a nonsteroidal anti-inflammatory drug (NSAID). 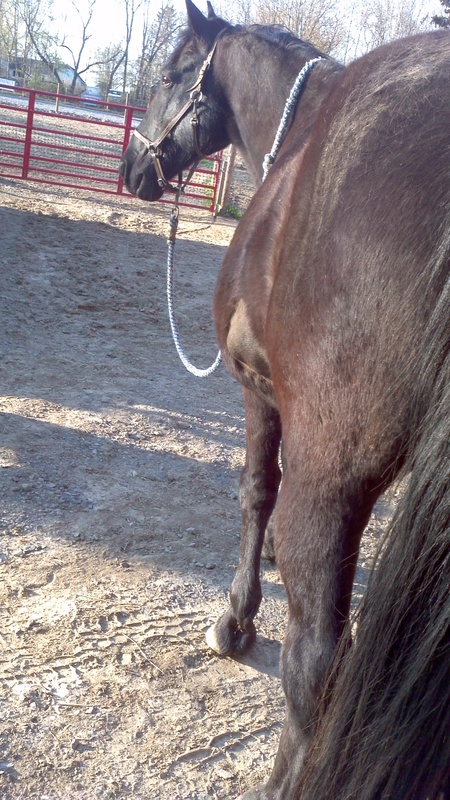 We thought it was a pinched nerve in the spine cause issues down his leg. 10/5 Medication did not seem to be working. He stopped eating all of his grain and was only picking at his hay. He still seemed to want grass but also started to chew on the wood. 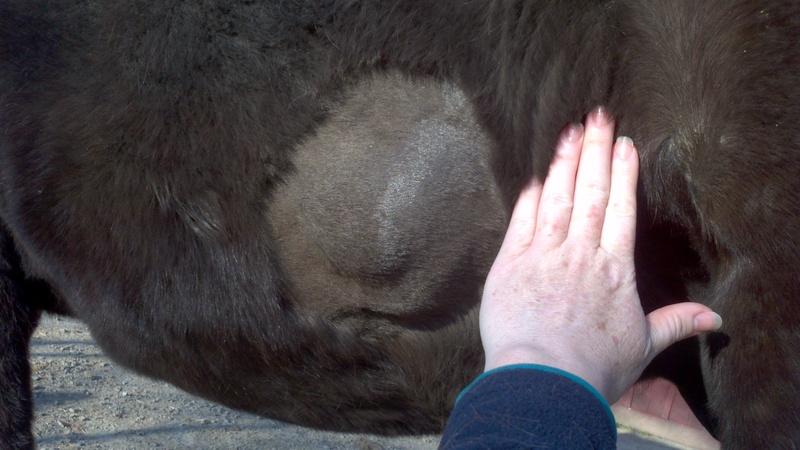 Vet said this was because of the bute so now he is getting Pepto for horses and a probiotic, to settle his stomach. He received a mild sedative and cortisone shots in his lower spinal area. If it is a nerve issue this should improve the situation in 2-3 days. Lyme Disease: A bacterial disease spread by tick bites. Read more about it here. Equine protozoal myeloencephalitis, or EPM, is a disease caused by a protozoal infection that affects the central nervous system of horses. 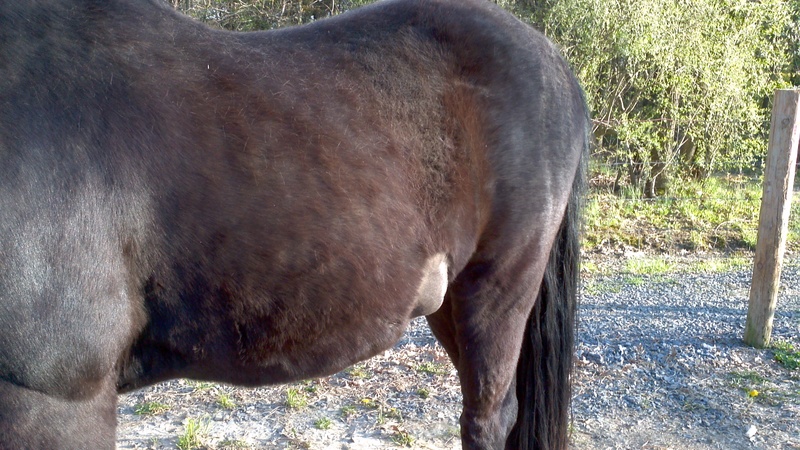 Clinical signs: stiffness, asymmetrical gaits and cranial nerve deficits, ataxia (incoordination), spasticity (stiffness, abnormal gaits or lameness, muscle atrophy, paralysis, difficulty swallowing, head tilt, seizures and collapse, abnormal sweating, loss of sensation and poor balance). Testing: We would have to take him to a local hospital for a spinal tap. They would have to sedate and restrain him for this procedure. At this point I am unsure he is safe to travel. 10/7 I gave him 2 grams of bute last night. It seemed to help as this morning, while still wobbly, stiff and uncoordinated he seemed in better spirits. Last night and this morning he ate a yummy warm mash of beet pulp, senior grain and treats. This morning he even decide to escape under the chain guard (across the stall door) so he could help himself to some grass while I was making his breakfast. As soon as he saw me putting it in his bowl he came back to his stall and ate all of it. We decided the following course of treatment. Send off sample for Lyme disease test. This takes 7 -10 days for results. If no improvement then we will consider testing or treatment for EPM. This is a video from today so you can see how he is walking. Word is spreading and the grass roots campaign raise funds for Nash’s Hernia surgery just passed it’s first week. I realized I failed to show you how bad the hernia is and what the surgery will fix. This week we decided to shave the spot so we could get a clear view of how bad it is. Then after taking these photos Nash and I had some quality time while he munched on some grass in between the spring blossoms.